I’m new to mags and just didn’t see a good answer for this. Somewhat mag specific. I recently picked up a ule ReTro valve mag. From what I’ve read, the SHP ninja is the way to go. Is there a macro line that will handle that pressure? Should I move to an alternative? Am I concerned about nothing? There is 1000 psi worrying [working] pressure macro line. Air soldier carried it. I'm not sure if that's the place to get it still. I've used it on high pressure feeds without much trouble. Don't bend it excessively and cause it to fatigue. On mags that will mostly be run on hp, I like to go with braided line. Last edited by Spider! ; 03-26-2019 at 08:14 AM. Ditto for me. My one mag I have setup to actually rip, ala 'rt', with a Ninja SHP tank I used steel braided line on. The ones with macro line I keep for standard output tanks. i buy all of mine from Macroline guy and have had no problems, just get the thick walled and not the thin and you will be fine. i have blown a couple of the thin walled ones and it's almost as soon as you gas up the marker so you will know it if you get the wrong one. I sell 920psi working pressure line. roughly 3000 burst. In the interest of full disclosure, I'd run braided if it were my setup. I don't run any SHP guns anymore though. I'd worry about the fittings. I'm going to hop on Jordan's bandwagon. People don't discuss the operating pressure of these things very often. Most of the macroline fittings out there are made by norgren and they don't have an operating pressure over 300psi. Obviously we use them above that all the time, but you have to wonder how much they can take. It's sort of the nature of the push to connect fitting. The more pressure you put behind that hose, the more it wants to push out! It also locks harder the more pressure you put behind it, but there are limits. I seem to recall if you want to use flexible tubing properly at pressures above 300psi it involves locking collars and other engineering stuff. That said I use macroline on most of my stuff, but if it's seeing co2 or running over 750 or so, I'm firmly in the steel braid camp. Here's a shot from norgren's catalog with 260 listed as the max working pressure. Other manufacturers like camozzi are in the same range. i've never seen a fitting fail from pressure but i do know you can wear out the o ring from installing and removing the macro line too many times. 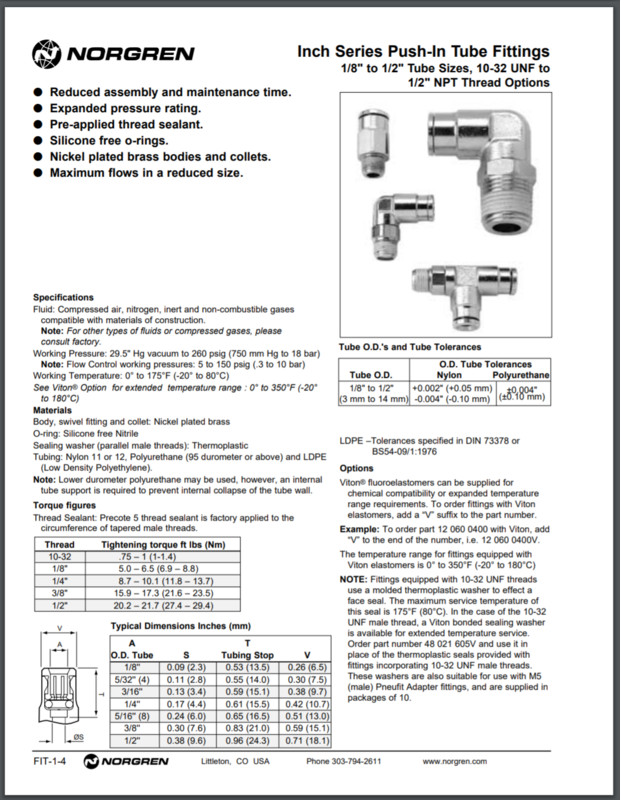 I've also seen a similar datasheet that stated tube fittings were rated up to the pressure of the tubing used in them, which makes sense except for leakage. I can see manufacturers only offering a warranty for lower pressures. Like electro solenoids being rated for something like 5 Hz. An interesting phenomena is using cold 1000 psi tubing and having to wait for it to expand enough to seal at 650 psi. In normal conditions that tubing doesn't stretch much. Structurally, the fittings are made with good wall thickness. The only time I've seen the tubing fail is in a piece that gets repeatedly pulled and bent, trying to make a chronic leak stop over about a year. It is that cold leak and bend fatigue that pushes me to braided line for an RT. If I'm playing RT, it's because there is a horde on the other side and the RT needs to be chugging along. There are higher rated Parker and Swagelok fittings, but they haven't proved necessary over a lot of use of the Norgren style. Another reason to use braided line is when you have a rear facing tube layout, that has a double bend near your wrist. Not only could it pop on your wrist or face, but you will be bumping it frequently. The normal layout where straight tubing is captured between two fittings is very reliable. Last edited by Spider! ; 03-27-2019 at 09:00 AM. I got to know the owner of one of the industrial supply stores where I lived years ago. His explanation of the 300psi ceiling was not material strength, but the slip fit collar. That makes sense as the only fitting failure I've ever seen (besides ruptured tubing) is the collar blowing out. Nevermind, I've also seen some swivel fittings separate, but I'm thinking that was probably physical trauma. Back when the Draguns and other Spyder knock offs were hitting the market 17 or 18 years ago, they came fitted with flexible tubing instead of steel braid. I saw more than one collar blow out with co2 on a warm day. I remember seeing another wave of blown out collars when Myth regulators became popular 10 years ago or so. No low pressure burst, so if the regulator failed, your gun took whatever the tank pressure was at the time. Very exciting! But you're right, there is plenty of material in these fittings to handle the pressures we throw at them. More times than not it is that bend that blows and you're absolutely right about the position of that hose on most automags. Steel braid exists for a reason and if you're pumping 1000+psi to your gun, a push to connect fitting probably isn't your best first choice.